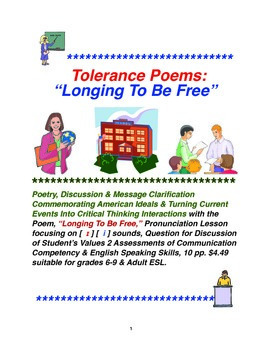 Tolerance Poems: "Longing To Be Free"
“Tolerance Poems: Longing To Be Free,” written by Norma Flores and available @teacherspayteachers.com, is a 10 page lesson in developing public speaking skills for multicultural non-mainstream students in grades 6-9 and above. 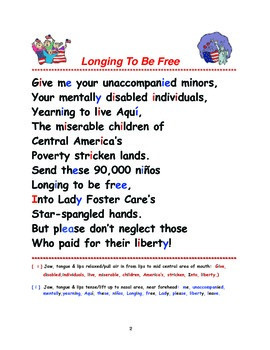 Page 2, features the Poem, “Longing To Be Free” describing the plight of Central American children trying to cross the border into the United States. It focuses on developing pronunciation proficiency by contrasting [ i ] & [ ɪ ] vowels in the poem, and can be very useful for Language Arts teachers working with ESL students at any grade level, or Speech Communication instructors teaching group communication skills. Also, directions for pronouncing [ i ] as in leave & [ ɪ ] as in live, are provided at the bottom of page 2. 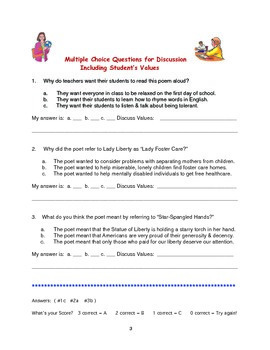 Page 3, consists of 3 Multiple Choice Questions for Discussion that encourage students to share their opinions from their own cultural points of view and explain how the question is relevant to them such as sharing their values of being tolerant, generous, decent & democratic. 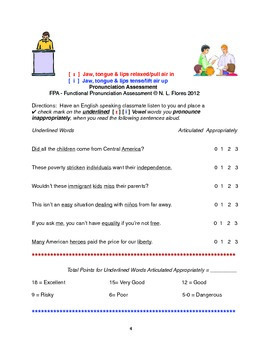 Page 4, features the Functional Pronunciation Assessment worksheet through which dyads meet to assess each others pronunciation competency of the target sounds. Page 5 is the ACCESS, Assessment of Communication Competence and English speaking Skills form. Students read the sentences a second time and evaluate themselves on the observable communication behaviors of: eye contact, audibility, pronunciation, grammar, emphasis & communication of message function & intention. Page 6, Lists the Contexts & Standards-Based Criteria for Assessing Articulation so that students may understand what level of communication competency they have demonstrated and try again if they need to improve. Pages 7-10, The Appendix: Provides suggestions for the Teacher/Facilitator about how to communicate orally about the poem, how to conduct student assessments through dyads plus, the author’s purpose for teaching this lesson multiculturally. This poem has received lots of positive feedback from multicultural readers/educators on Facebook & Twitter due to the very current issue of immigration reform that the country is facing. Help your students get in on the decision-making process too!